Seasonal Blogger. Is There Such A Thing? Well, there better be seasonal bloggers, cuz I am one! I know – it would be ideal for business and blog followers if I would maintain the B and B blog year-round, but that’s not the way it is. You see, I live two different lives – one in Homer, Alaska with my wife Maria (summer), and one in Brainerd, Minnesota – where I am from (winter). When I go home to Minnesota in October, I transition to taking care of my Mother Sharon, Hanging with my son Ben, my daughter Lauren, her husband Michael, and my granddaughter Hazel. There’s also my numerous hunting, fishing, and trapping partners – my best friends who I play with regularly. And my Minnesota job – being the “mental health guy” for all the clients that cycle through a Minnesota Adult and Teen Challenge, Long-Term and Short-Term, Mens Inpatient Substance Abuse Treatment Facility. Now there’s a mouthful! Since I strive for fresh content for the Majestic View Blog, and since I am not there in the off-season, and since there isn’t much going on anyway – except winter season rentals, I sort of go “off the grid” for awhile. But come May, the transition happens. Like the birds, I migrate north to Homer. Things start hopping, and before you know it, we are busy as bees, and fresh stories, photos and video are coming out the ying-yang. And that’s what just happened. Usually, I drive. This year, I decided to stay in MN longer to work, and do some of the activities that I have really been missing the past few years – like crappie fishing, bass fishing, and wild turkey hunting. Saturday, I got the trip over with, super fast, by arriving at MSP airport by 5 am, flying to Seattle for a short layover, and then on to Anchorage – where I met Maria at 1pm, had a little down time with her boys, did some shopping, sleeping, and made the four-hour trek to Homer on Sunday afternoon. The good? Getting the trip done in less than 36 hours, as opposed to the long grind up the Alaska Highway, which takes a week or more these days. The bad? Heavy petting (actually, more like groping) at the airport complements of our wonderful TSA – who, under the guise of making us feel safe and protected – foil zero terrorist attacks that I have heard of, but instead, violate millions every day in this country – me being one of those who gets it EVERY TIME because of certain physical issues that put me “on the radar.” I seem to have a knack for pushing things as far as I can – without getting arrested (so far, anyway), and this time was no exception. I find that it is really hard to smile and tolerate it when some dude insisted on feeling your junk from every angle, while everyone watches. Being a Christian man who takes his faith seriously – I feel confused. On one hand, when the TSA kneels to get in close, I want to encourage him to get a different job with my very hard and capable artificial knee. You know – that thing they do in cage fighting called the flying knee? But the bible tells me to turn the other cheek, and smile, and kill everyone with kindness. Does that mean I drop trow to offer easy access? Well, therein lies my confusion. This time, I went with something in-between (mental-health people always call for balance, right?) – the verbal protest, loud and obnoxious, which brings much needed attention to the plight of us poor travelers and what we have to endure. I figured, what the heck, they want to humiliate me, right? I might as well help them, and let them join in the fun! Accompanying me on this flight was my near-constant companion “Sam -E” – also called Sam Elliott when he is in trouble, Sammy, Samson, Samsung, Sam Wise Gamgee, Samsonite, and just about any “Sam Name” you can come up with. He will come to them, usually. Sam is my 8-month old Gordon Setter puppy, who was born in Oklahoma, came to Minnesota last November, spent the winter with Maria and her two Aussies Brody and Blue in an Ice Castle (now there’s another story), and finally, flew with me to Alaska to spend the summer getting used to what I have told you is my second life. Yes – if you are scheduled to go out on the ocean with me on an adventure, if at all possible, Sammy will be along – for he loves being out on the water, in the boat. He watches the birds especially, and even gets so excited that he jumps out after them while under way, but I think I am getting him cured of this. He is sweet, loves people, and I’m sure you will just love him! Yesterday, Sam got his first nose full of moose. Our guests staying in the Moose Manor apartment were on their deck, enjoying the wonderful view of Kachemak Bay, and the snow-capped Kenai Mountains, when Brody and Blue came flying by, not 15 yards away, in hot pursuit of a yearling cow. Sam saw this, and couldn’t help but to join in on the fun. And so a couple from Michigan not only got to see a moose up-close-and-personal, but they got some good entertainment as our “herders” brought the moose in a full circle around the lower deck areas, and back up to the side-hill above the house. Well, just come stay with us – you’ll see. We have trained moose herders who work for you! Right away, the work started. Scheduled bright and early Monday morning is the installation of a brand spanking new 200 horse Suzuki outboard. But I arrived to a flat tire, a dead battery, and a shrink-wrapped boat that needed to be uncovered and hauled down the hill. While Maria fed our 9 guests an amazing breakfast (yes, you must experience this as no one in the B and B industry does it quite like Maria anymore) – I fixed the flat, charged the battery, uncovered the boat, and hauled it down to All-Seasons Honda, where the installation will begin. With priority number one complete, I will move onto the never ending work that it takes to make this B and B one of the best, inside and out – so that you can enjoy your stay with us to the fullest extent. There’s dead grass to rake. Moose poop to rake. Lawn to mow. Trees to trim. Pushke to haul away. Flowerbeds to clean. A driveway to grade. Flowers to plant. Rod and reels to maintain and set up. Boat to organize and test. Ditch to clean so water runs. Two breezeway projects to complete. A greenhouse to fix. And that’s just the outdoor part. Maria will have a “honey-do” for me for the inside of the lodge, and our seven units. We do what we can, every day. Soon, the busy season will be upon us. The parking lot will be full. The house and yard will be bustling with happy travelers who pause in a very cool place to eat, sleep, and enjoy some conversation with people from all over the world. They will “pick Maria’s brain” for all the best things to do and see while in Homer. Some of them will accompany me on the ocean to see whales, sea otters, black bears, mountain goats, tufted puffins – and all the other wildlife that abounds amidst some of the most beautiful scenery on earth. Some will even catch salmon, halibut, or hunt a black bear. 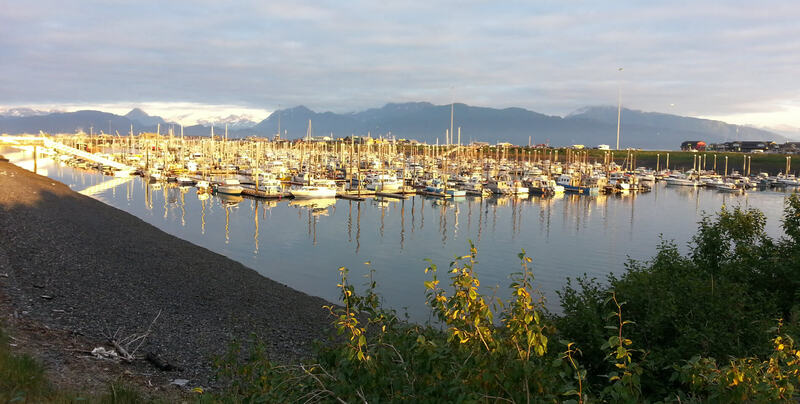 No matter what you want to see and do while you are in Homer, rest assured that it is one of the greatest places to visit in Alaska, and Maria and I are committed to combining our experience, knowledge and talents – so that we can offer a “one stop shop” for you to do it right while you are in Homer! The man is telling me that my job is wrapping up – yes, four new tires on the “Green Beast” (that’s my truck) – another upgrade for this year. I figured having four flat tires last season was telling me something. Hate spending the money, but hate it worse when I got trips to fulfill, and I wake up to a flat. Lets get back to zero flats a season, huh? We look forward to hosting those of you who know your’e coming. 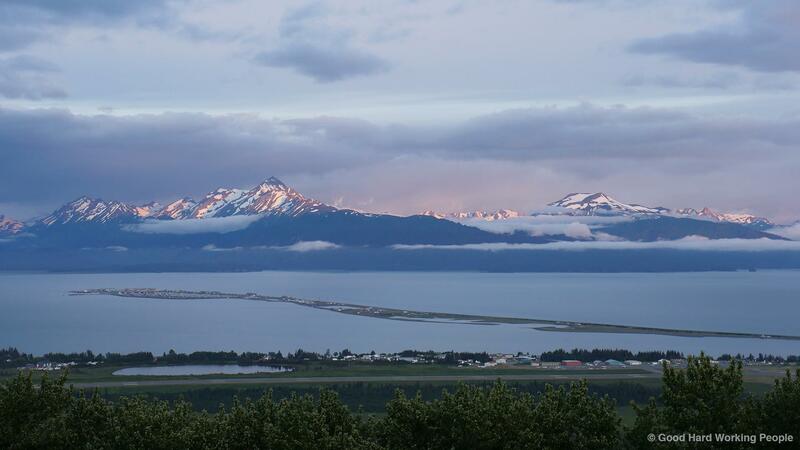 We hope others of you who read and follow will consider coming to see us in Homer, Alaska. If not this year – save up and plan for next (you will never, ever regret it). And while you wait – follow my blog, which will have fresh content now for the next five months or so. As often as I have time and energy, I will get on here and share a story. Let you know what’s happening at Majestic View. Post the latest picture or video. And who knows – perhaps next winter I will be inspired to share Minnesota life with you for the off season (who’s interested)? Be sure to go to Majesticviewbb.com to find out all about us, our B and B, our rooms, our location, our services and availability, our ocean excursions, and more! Until next time – Tim, Maria, Brody, Blue, and Sam-E too! Gotta get the hubby to commit to next summer.